Here comes a brief update on my tourism activities in Georgia, after successfully implemented organized tours in Georgia service, I've decided to push to the new limits and as of the start of April 2017, have re-launched tourgeorgia.eu - platform listing tour packages in Georgia. Tourgeorgia.EU, originally launched back in 2011,was my first attempt building a travel portal about Georgia (you can find some articles about development regarding this website in archive, see: Tourgeorgia.EU). Over years I stopped any development works on Tourgeorgia.EU, instead built a pretty popular blog section in frames of this blog, listing my own unique experience and discoveries in Georgia, see All About Georgia. As I was getting a lot of travel requests on blog's contact form, I decided to test a minimum viable product approach, and decided to offer a tour service from blog and partnered with few really great tour agencies here in Georgia. After first 3 months in operation, I can proudly report 30 bookings have happened already. tourgeorgia.eu offers concierge service in Tbilisi and Georgia. 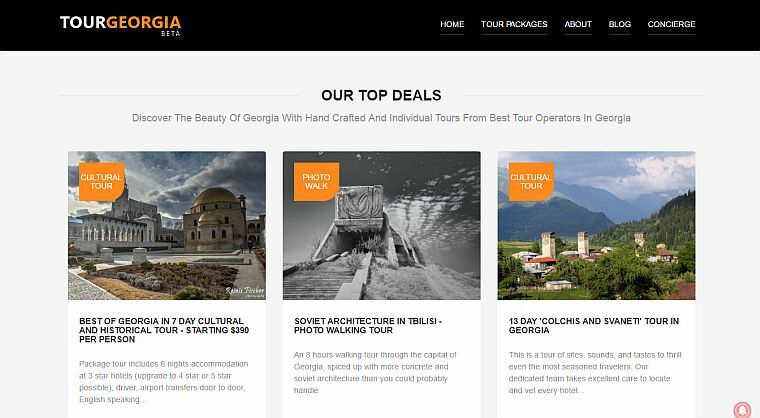 Here we have brought together tourism professionals and true lovers of their activities, offering variety of tours in Georgia in following fields: cultural tours, wine tours, adventure tours, jeep tours, spiritual tours, medical tours and extreme tours. Either you are searching for all inclusive week long tour package or you just need a simple airport transfer to the skiing resort, feel free to contact us using form bellow or writing to info@tourgeorgia.eu and our concierge department will do all the best to make your journey to Georgia unforgettable. Also I would like to express my gratitude to Mrs David Gablishvili form traveltogeorgia.net for being such understanding and competent business partner and being in this journey together with me. I will keep writing about my experience about living in Georgia, continue to review Tbilisi restaurants and of course listing more cool sites to discover. For any travel plans, tour reservations, hotel bookings and so on I kindly invite to use tourgeorgia.eu.